This machine has a large 10.1″ built-in high definition LCD display with faster processing than prior models and a scanner for a live, close up view of the needle area! 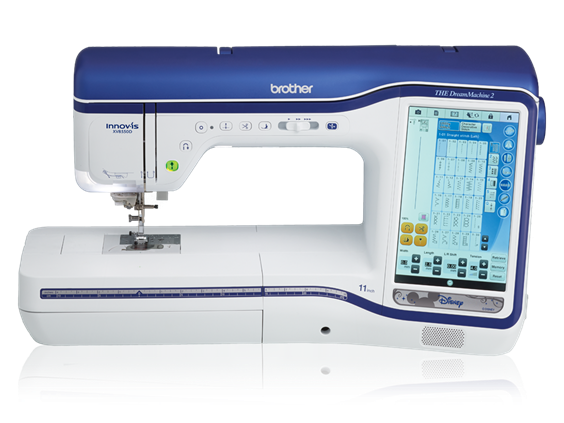 It has the ability to scan the entire embroidery area for perfect positioning! The maximum embroidery area is 9.5″ x 14″. There are 982+ built-in designs, including 166 designs featuring Disney characters, 140 frame pattern combinations, 22 embroidery lettering fonts and 5 sewing lettering fonts! Have the machine scan line art, handwriting, or printed clipart to have it transformed into embroidery stitches! You can also draw your own images on the machine screen itself.